San Francisco: I've always liked driving Acura’s. There's something about the way they mix precision, comfort and value that makes them a perfect compromise - a step above ordinary cars, but not so expensive and outlandish as to make you feel guilty. After updating the MDX's body style in 2004, Acura turned its attention to the interior this year, where several new features are offered as standard equipment. 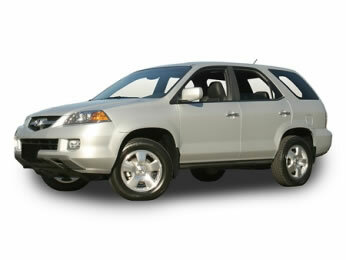 Outside, the Acura MDX looks like many other SUVs, with a clean, aggressive body wrapped around a big, boxy cargo area. Its refinement and quality beneath the surface are what really set it apart, though. Of course, some people say Acura’s are nothing but overpriced Honda’s. I say that's rubbish. It's like calling a Porsche an overpriced Volkswagen or a Mercedes an overpriced taxicab with leather seats. Anybody who's driven the two knows there's a big difference. Acura's mid-size SUV has all the plebian trappings of an ordinary SUV, at least on the surface. It's got seven seats, a healthy size cargo area, good-looking body and smooth ride - the same basic features families have demanded for a decade. There's nothing particularly groundbreaking here, as a zillion other SUVs offer a similar look and layout. But what hides just beneath the surface makes the Acura more appealing than its competition. For starters, the way it drives inspires more confidence on the road than almost any SUV, except for the hyper-performing Porsche Cayenne and BMW X5, both of which cost a whole lot more than the Acura. Like the German super-haulers, the MDX was clearly designed more for high-speed performance than off-road toughness. It hugs the road in corners, sticking to the asphalt better than its beefy size and tall profile would suggest, and its independent suspension seems almost sporty in its quick response and car-like manners. It's very predictable, lacking the bounciness and uncomfortable swaying that make many SUVs feel awkward in highway traffic. It's really fun - at least as much fun as you could expect an SUV to be - thanks to its good, solid brakes and precise steering, both of which build the driver's confidence. You're tempted to push it harder than most SUVs, relying on later braking and more nimble lane changes than you ever would in, say, a Ford Explorer. In fact, the entire vehicle has a feeling of solidity and quality that's hard to find in the competition. It's built like a tank, but it's still light on its feet. This sense of quality and precision is also evident in the cabin, where tight fitting panels, solid-feeling knobs and soft, supple materials emphasize the fact that this SUV is engineered and built to a higher standard. There's nothing too flashy or ostentatious - no huge swathes of chrome or Bentley-like expanses of wood trim - but it seems upscale at the same time, just enough to make you feel comfortable without getting that "I pitty the little people" sensation of a super-high-end luxury car. It's a good, reasonable balance between practicality and opulence. For 2005 the interior changes include making XM Satellite Radio standard on all models and making the optional navigation system faster and more comprehensive. Plus models equipped with the rear-seat DVD player now come with an in-dash, six-disc CD changer as opposed to the under-seat changer with 2004 models. A 3.5-liter V6 engine makes 265 horsepower and 253 pound-feet of torque in the MDX, enough for quick acceleration and medium-duty towing (up to 3,500 pounds for trailers). The engine feels like a V8 in many ways, offering plenty of low-end power and a strong grunt off the line, but it revs smoother and gets better gas mileage than its V8 counterparts. It's a terrific engine, one that feels especially refined thanks to a five-speed automatic transmission. As far as value is concerned, the MDX, like all Acura’s, come standard with lots of goodies and has a very short option list. It starts at $36,900 and maxes out around $44,000 for a fully loaded touring model with a DVD player and navigation system, which isn't bad at all for such high quality and so many features. You can spend a lot more money and get a slightly better SUV, or you can spend a little less money and get a much worse SUV. But no other sport-utility hits the sweet spot between value and luxury like this Acura.